Summary: Curiosity continues up hill. Opportunity has wheel problems. Reader Phil Veerkamp sent me a beautiful panorama he stitched together from recent Curiosity images of Vera Rubin Ridge, directly to the south of the rover and higher up hill. Below is a reduced resolution version. Be sure you click on it to explore the full resolution image. 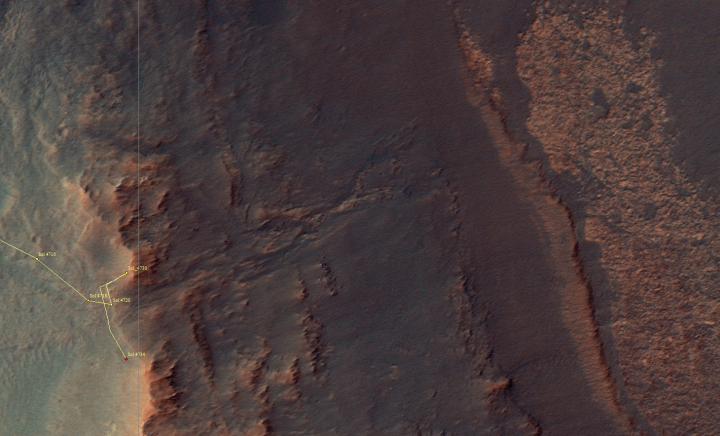 This is a new type of terrain, significantly different than anything Curiosity has seen up to now. It also appears that the rover will see far less dust, and might be traveling mostly over solid boulders. Below I have cropped out a very small section of the ridge line near the center of the full image, just to illustrate this. 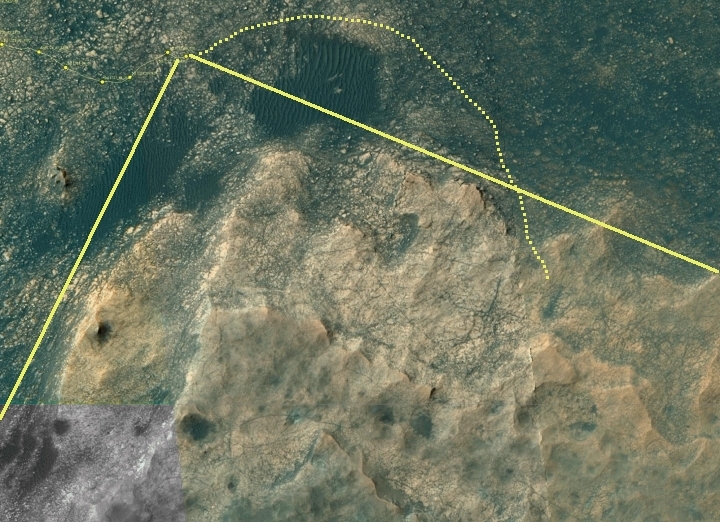 Below is a cropped annotated section of the most recent traverse map showing Curiosity’s location as well as the view shown in the above panorama. I have also indicated with the dotted yellow line where they are heading to get up on the ridge. They need to circle around the sand dune and then work their way up the slopes to the east. Travel should get significantly more interesting in the coming weeks. Since my my May 15th update, the Opportunity science team has been acting like an expectant father. They had reached the head of Perseverance Valley in mid-May, but since then they have been gingerly pacing back and forth, studying the valley from the top and the side without entering it. The traverse map above shows their travels for the first two weeks after their arrival, but it is also a month old. While they haven’t yet posted an updated traverse map, my daily review of the images sent back each day suggests that, through June 4, they continued their pacing at the head of the valley, sometimes easing downward a bit, but never entering the valley itself. They initially had two reasons for not entering the valley immediately. First there is fear, fear that once they go in they will not be able to get out. The gully has a steep slope and they are unsure of the stability of its surface material. As they have paced they have been studying its make-up from a distance in order to plan a safe route down. Second there is science. Once they enter the gully, they will have disturbed its flow patterns. Before they do that they want to document as much as possible those patterns, which can tell them much about what caused the flow. While liquid water is considered the most likely candidate, there is no guarantee that is the case. Wind is also a possible cause. Today, they issued this color image of the gully, one of many taken during the past seven weeks. Below is a reduced resolution version. If you look close you can see the faint drainage swales going downhill from the left to the right in the center of the image. Since June 4th, however, they have had a third and more serious reason for not entering the valley, and in fact have not moved the rover much at all, because of a new problem with the left-front wheel. The rover experienced a left-front wheel steering actuator stall on Sol 4750 (June 4, 2017), leaving the wheel toed out by 33 degrees. Our initial attempts to straighten the wheel failed to yield any results and were suggestive of a mechanical cause for the stalls (in the steering actuator). Fortunately, however a repeat of the diagnostics on Sol 4763 (June 17, 2017), added a twist that may have made a difference. In addition to attempting to actuate the steering at different voltages in a straightening (toe-in) direction, the team also commanded very small (half degree) actuations in the toe-out direction in between the straightening attempts. While these also stalled, the very last straightening attempt appeared to break free from whatever was impeding it and steered the wheel to straight. This very good result was tempered by the fact that we still do not know for certain what the cause of the stalls was and whether the problem could reoccur. Therefore, Opportunity will be exercising a precautionary partial moratorium on usage of the steering actuators for the foreseeable future. Specifically, this directs no front usage of steering actuators and only rear usage as circumstances might demand. Instead, tank turning and steering will be used wherever possible. The first nominal drive under these new restrictions was executed on Sol 4766 (June 20, 2017). It remains to be seen whether they will risk the rover and go down into the gully. I suspect they will do some further pacing on the rim, testing their legs you might say, before making any decision. Thank you for creating that wonderful panorama. It is truly beautiful. Thank you for pointing out the full resolution image. I would have missed it otherwise. I love that you are getting crowdsource content. 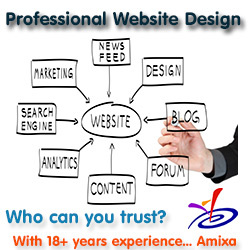 It shows the enthusiasm that your readers have for your site and your reporting. What program do you use to annotate the pictures? I use Gimp. As you probably know, based on past posts here, I work on a Linux computer. I also try to use as many open source programs as possible. Gimp is a truly excellent graphics program. I have been using it for more than two decades to complete the many cave maps I have drawn. I heard there’s a skin for GIMP that makes its user interface look like that of Photoshop, for those used with that. There doesn’t seem to be any immaterial property rights that stop making software that function and look like existing software. Thanks Robert Zimmerman, I think I asked this one before. Been a while since I tried gimp, will have to try it again. I have mostly been using phone apps, snapseed and photo editor on android, to modify pictures, some of them work surprisingly well but have to do some tasks in one than others in another.